The large environmental devastation that the expansion of these extractive megaprojects involves would have a deep impact on life in the whole country. Could the crisis of the accumulation model open a period for a greater “environmentalization” of social movements? Venezuela’s current severe crisis is to be seen not only in the stagnation of the transformation processes of the Bolivarian Revolution, but also in the concrete advancement of conservative forces and policies, reflected in economic flexibilization measures  , dismantling of popular participation spaces and important changes of actors in positions of executive and legislative power, the latter now controlled by the Venezuelan opposition. As part of this process, the national government is now driving a significant geo-economic reorganization of territories around extractivism, with “Orinoco’s Mining Arch“ and “Orinoco’s Petroleum Belt“ as central projects, along with other mining enclaves and important sources of offshore gas. 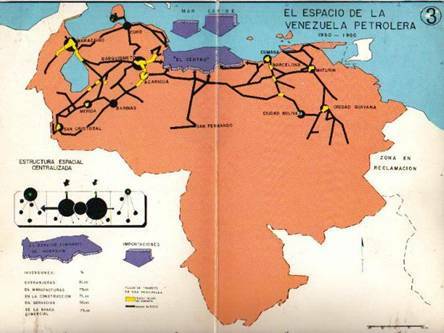 This is a historic change of Venezuelan ‘rentier capitalism’ territorialization (understood as production of the territory, highlighting the connection between deterritorialisation and reterritorialisation processes), expanding rapidly -both in extent and intensity- into new “commodity frontiers”. The appropriation of the last “virgin” areas of the country paves the way for new “accumulation by dispossession” processes, attempting to address the crisis of governability and accumulation model. 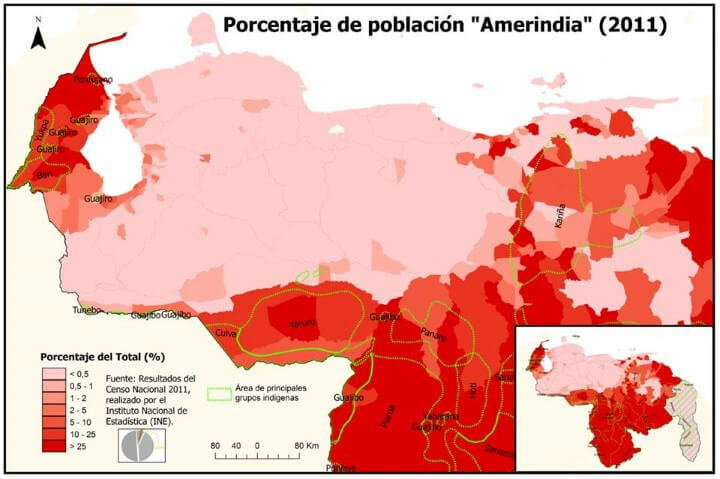 A new cartography of extractivism is being constructed in the country, stretching the map of the last century, in which the Zulia and East oil enclaves have been predominant, along with the north coastal urban belts – 95% of the population lives north of the Orinoco River. The frontier expansion now attempted had been sketched since 2004, when President Chavez’s government achieved political hegemony and planned for the relaunching of extractivism in the context of global commodity boom. The current context of crisis and Venezuela’s petro-state weakening of international bargaining power, made capital appropriation of commodity frontiers even easier. Expansion into natural reserves, offshore extractions, or national parks – with emphasis on the south of the Orinoco River – is promoted through economic openness and the acceleration of “attractive” agreements with multinational companies. An unprecedented leap in nature’s commodification occurs when an inventory and certification process of all “strategic resources” is advancing (see for example the “mining map of Venezuela” and the “Magna Reserva Mining Project”). The Orinoco basin is being projected as the future principal extractive nucleus, where mega-mining plays a key role. Official statements since the last third of 2015 announce the construction of a new “diversified” economy and call “Orinoco’s Mining Arch” (OMA) one of the main extractive enclaves of the new commodity frontiers. The latter is a gold-rich area of over 111,000 km2 (12.2% of the country) located in the southern states Bolivar and Amazonas, rich in gold, coltan, diamonds, iron ore and bauxite, among others, and has been open to some 150 international companies for exploitation. The national government now hopes that Venezuela will become the second gold reserve and one of the main “producers” of the world. If we add OMA’s territorial extension to the Orinoco’s Petroleum Belt (OPB) area, where we notice a historic leap in extraction intensity, reaching 1,228,300 barrels per day in 2014, we would have a total of 175,000 km2 mega “development pole” – an area equivalent to the entire territory of Uruguay. The accelerated search for frontier expansion also prioritizes offshore gas, with “Rafael Urdaneta” and “Mariscal Sucre” projects, ranging from the Gulf of Venezuela to the Paria peninsula, in the state of Sucre. This does not only aim to cover the domestic market but also to gas exporting, for the first time in Venezuela’s history (Teran Mantovani, 2016). It also aims to recover and expand as never before coal mining extraction quotas in Zulia (Carbozulia Corporation projects) and nickel extraction (“Lomas de Níquel” project) in the south of Aragua and Miranda. Lastly, it aims to promote incentives for public and private companies to expand fishing activity, with emphasis on tuna fishing in the “Venezuela Aquaculture Fisheries Belt” (Atlantic and Caribbean Coast), also with a projection for export. During the rise of the Bolivarian Revolution, official environmental discourse was central in the social grassroots that had supported the national government. Among other things, President Chavez popularized the idea of “eco-socialism” and even introduced it in the Socialist Development Plan 2013-2019. However, the accumulation by dispossession processes that are open in the new commodity frontiers end up delegitimizing the ecosocialist promise of the official emancipatory narrative. Instead, the Venezuelan government now pursues a re-signification of “environmental protection”, merging claims of extractivism in what results to be a rather paradoxical discourse. Several elements can be drawn from a series of official statements and advertising campaigns in relation to AMO project that construct such discourse: the idea of a mega-mining that would be focused in environmental conservation; “friendly” images of mega-mining in order to incorporate them into the development imaginary of the Venezuelan people; representation of indigenous peoples as mining people; and a new legibility of the Orinoco River, to be assimilated by the discourse and imaginary of development. A territorial expansion of this type usually comes along with the establishment of governance mechanisms for the so-called “natural resources”. I here highlight two territorial intertwined policies. First, the “Comprehensive Regionalization Law” of November 2014, proposes the creation of “Strategic National Development Zones” (SNDZ) and “Special Economic Zones” (EEZ) – taken from Chinese model –, allowing for an integral liberalization and deregulation of geographical regions, as well as the establishment of ad hoc governments. This law eventually aims at the regionalization of territories with the target of creating a special regime of governance. The geographical reorganization facilitated here does not focus solely on the implantation of an extractive enclave, but also on the construction of a development pole (cities, roads, industries). It thus constitutes a new form of “capitalism-in-the-nature” through the establishment of mining, petroleum, and fishing “belts” officially decreed as SNDZs. Companies operating in these special areas can hardly be regulated in environmental terms. The other policy refers to the actors that institutionalize its political hegemony in this regime of governance: military sector and transnational corporations (and a coalition between them). The 02.10.2016 act (Official Gazette No. 40,845) for the creation of the “Military Company Limited of Mining, Petroleum and Gas Industries” (CAMIMPEG) is not only linked with the current processes of “securitization” of the country’s “natural resources” but also gives power to the military sector for a direct management in the extraction process. CAMIMPEG will enable a long list of operations, including “all matters related to the lawful activities of Oil field Services, Gas and Mining exploitation in general”, without limitations. The combination of military power with the highest level of territorial dominion by transnational companies through the SNDZ, points to an oligarchic form of configuration governing the commons for life. The foreseen scenario thus includes the known terrible effects of open-pit mining joining the highly polluting extra heavy oil extraction from OPB. As one example, the “water footprint” of gold open-pit mining has an estimated range of 450 to 1060 liters per gram of gold obtained, and extra-heavy oil extraction needs 3 to 4 barrels of water per barrel of oil extracted. The FPO/AMO area is planned to be developed in the middle of the country’s most important hydrographical basin, with the precedent of the historical devastation of the Maracaibo Lake warning for the future of the fragile Orinoco Delta. The growing problems of water pollution and water access for the urbanized northern region are becoming more noticeable, especially in the context of current severe droughts. In addition, we see greater predation of areas such as Imataca Forest Reserve and national parks such as Canaima or Aguaro-Guariquito, among others. The large environmental devastation that the expansion of these extractive megaprojects involves would have a deep impact on life in the whole country. Diverse conflicts and resistances are developing, whether against extractivism or illegal mining – at southern Orinoco –, or for the defense of territories, or environmental justice. The country’s indigenous peoples have a fundamental role in these struggles. Located within the new commodity frontiers and new projects’ territories –launched without any prior consultation– indigenous people face extraordinary threats of subsistence. Conflicts arising thereof, are examples not only of the direct or indirect effects of mining in their territories, which would be remarkably aggravated by this extractive expansion, but also of different levels of resistance that aims to counteract and / or prevent it. Examples are the low intensity conflicts of the Kariña people’s against methane water pollution in Tascabaña, or more intense conflicts such as the Yekwana and Sanema peoples, whose territory has been contaminated by mercury in the Caura River Basin. The Yukpa people in the Sierra de Perija are resisting the expansion of coal projects with several indigenous killed in recent years and the Pemón people have been involved in disputes with military sectors and irregular armed groups around mining in southern Bolívar. It is important to emphasize that these struggles are often little known or supported in urban parts of Venezuela. Cities host 90% of the country’s population and this population appears indifferent to the environmental degradation processes taking place in distant and rural territories. The paradox for a country as urbanized as Venezuela appears then to be that, to stop the train of extractivism or at least to slow down as much as possible its rampant motion, there needs to be a growth of an environmental justice movement in the cities. Could the crisis of the accumulation model and the increase of difficulties in water access in cities, along with their growing unsustainability, open a period for a greater “environmentalization” of social movements? It is likely. Recently, several urban movements have grown, influenced by ecological approaches or incorporating such claims into their demands. These experiences constitute the organic beginning of a desirable and necessary transformation of our relations with nature and of our society models, based on the premise of defending livelihood and life. Reference: TERAN Mantovani, Emiliano (2016), Statements by the Minister for Petroleum and Mining, Eulogio del Pino. Audio file. January 18. Zulia government facilities.